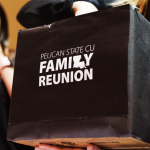 It’s true what they say—the Pelican State Credit Union culture reminds everyone of one big, happy family. 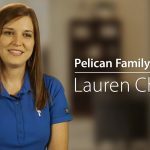 When someone’s life changes at Pelican, everyone in the company becomes a part of it. I recently got married, and I couldn’t imagine any other company treating my marriage the same way my Pelican family did. Every summer, I take at least one big beach trip. Last summer, I took about a week and a half off of work to go to Orange Beach, Alabama, with my boyfriend’s family for five days, and then spent time with my family for four days. Most people thought my boyfriend would be popping the big question while we were at the beach. It was a perfect set up – both of our families there, beautiful scenery, and it seemed like the perfect time! Well, unfortunately, by the end of the trip, I came to terms with the fact that I wasn’t getting that new, shiny ring. A couple of days after we returned home from the beach, it just so happened to be my birthday. We had a fun weekend planned in New Orleans to celebrate with my friends. Well, sure enough, my boyfriend gave me the best present ever and surprised me by dropping down on one knee and giving me the ring of my dreams! Needless to say, I wrapped up my vacation time on cloud 9. However, Sunday night rolled around, and I was so bummed when it hit me that my vacation, birthday and engagement celebration was over…or so I thought. Monday morning, I walked into work and saw my absolute favorite cake – cookie cake with LOTS of chocolate icing waiting for me saying “Happy Birthday” and “Congratulations” with a ring on it! Returning to work wasn’t so bad after all because my amazing co-workers kept the celebration going. I got to share my proposal story over and over again and eat cake all day; it was perfect! 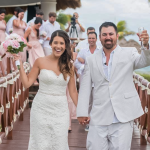 At Pelican, big life moments aren’t taken lightly – they celebrate BIG, whether it’s a birthday, a new baby or an upcoming wedding. My co-workers knew that my wedding was taking place in Mexico in June, and my absolute favorite holiday is Cinco de Mayo. So in early April, I received an email that went out to everyone at our Corporate Headquarters inviting them to a “Bridal Fiesta” during lunch break on Cinco de Mayo in honor of me! 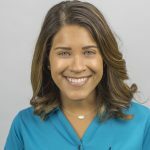 I’m not a fan of having the spotlight on me so I got super nervous when I saw it, but I also couldn’t help but feel so excited to celebrate my upcoming wedding with my amazing work family. Fast forward to May 5, and it’s time for my Bridal Fiesta! Our department was crazy that morning – everyone was running around to set up for the shower and get the food warmed up. 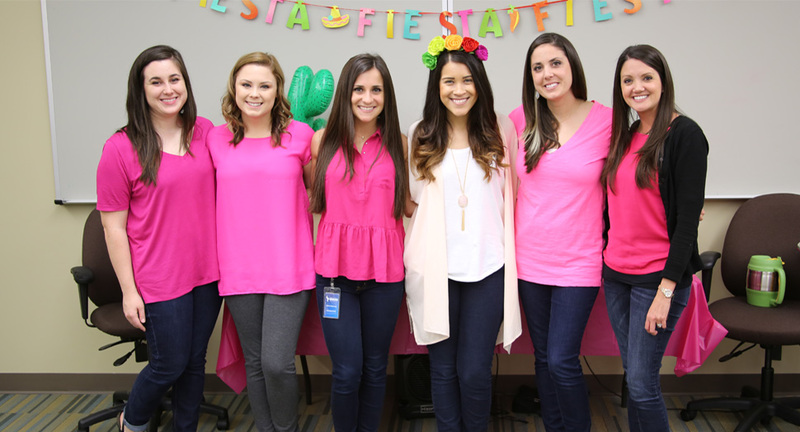 Plus, the ladies in my department all wore hot pink shirts to act as my “work bridesmaids” for the shower. I walked into the room and immediately felt overwhelmed with love! 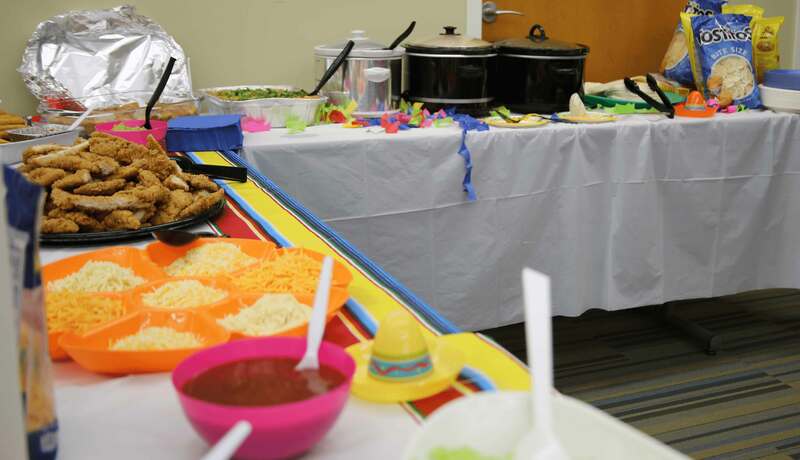 The menu included all of my favorites – a nacho bar, taco bar, chips and salsa, yellow cupcakes with chocolate icing and so much more. There were so many co-workers there from all different departments, even some that I rarely get to talk to. The room was covered in fiesta decorations and Spanish music was playing in the background. There were also a bunch of gifts and cards piled up for me to open. My Bridal Fiesta was truly an amazing experience with my work family. I had so much fun getting to talk to everyone about my wedding, eat delish food and open so many special presents. To feel that kind of love and support from the CEO and Senior Administration to departments that I rarely see to my own department made me realize how special Pelican really is. Proud wifey. Lover of Mexican food. Obsessed with planning parties and beach vacations. Enjoy watching Friday Night Football. Addicted to Burt’s Bees Lip Balm.